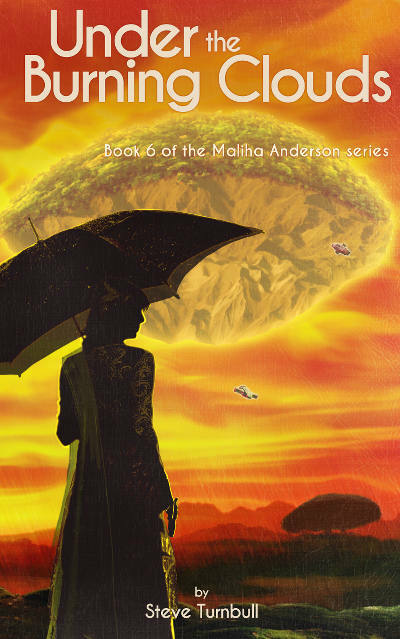 My final book of the year, Under the Burning Clouds (the last in the Maliha Anderson series) was published on December 30th, 2015. It is essentially the second half of the story that started in Thunder Over the Grass, and concludes the primary story arc that started in Halo Round the Moon. I also published Wind in the East and the side-prequel Broken Vows, so that was four in the Maliha series. Venusian joke: "How do you know it's not raining?" "The umbrella doesn't keep you dry." To understand it you'll have to read the book (but you'll have to read the others first). I also wrote and published each one of the Iron Pegasus books (although I started writing the first one in 2014), plus the second and third stories in the Frozen Beauty series. I did have plans to publish The Faraday Cage anthology but that will now be February (probably). As I may have mentioned all these books take place in the same universe, there are crossovers, for example characters from Iron Pegasus appear in the last Maliha Anderson book. After a fashion I'm doing my own Avengers Cinematic Universe thing. While not planned in detail I do know where the stories are going. Characters from the web series, the feature film, Maliha Anderson, Iron Pegasus and Frozen Beauty (and others not yet written) will be coming together one day in a combined series. In my alternate universe 1911 is the outbreak of the Modern War. Imagine the temperament of the combatants in the First World War using technologies that are more like WWII, plus space travel. It’s not nice. BUT I won't be writing any of that in 2016. Seven plus years ago I wrote a TV series pilot called MONSTERS. I planned out five entire series for the show and I'm going to be turning those outlines into five books: the KYMIERA series. The inspiration for the story was Buffy the Vampire Slayer. When it ended I decided I needed to write a British "version" of Buffy, but pure SF, no supernatural or magic. Five books at a minimum of 80,000 words each, that's 400K (at least, probably more). But that won’t be my only task. I still have to produce the Voidships anthology: The Faraday Cage, which I am very excited about. And at some point in the year I’ll be releasing the table-top role-playing rules for Voidships (based on the Savage Worlds game system, for those of you who know about such things). And by then I'll be ready to kick back into the steampunk (though I'll have to complete the Patterner's Path series some time).